This sounds like a great read! I really like books that use emails, facebook, or twitter in their stories. I think on one of Meg Cabot’s books (in the Boy Meets Girl series) she even included notes the character had written on menus and napkins. 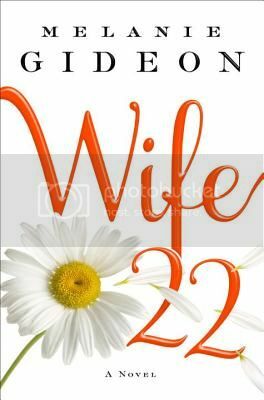 Wife 22 sounds like it’d be a good book club read too, I’ll have to check it out! It would be a GREAT book club book! Very conducive to discussion. Didn’t think I was interested in this book, but now I’m totally intrigued… great review! A book I’ll look for at the library. Sounds like something I’d enjoy reading about. This book was not on my summer reading list but after reading your review, it will make it’s way to my wish list. I am intrigued about the way the story is told. Great review! I saw this book on a couple of blogs and totally passed it by because of the cover, but it actually sounds really interesting! I really like witty books that carry a strong message and this seems to fit the bill. I didn’t go back and pair up the questions with the answers. I liked the mystery of it and wanted it to remain that way for me. I just lent this one out, I’m curious what she thinks of it. I only did because someone recommended it, it was really fascinating, how she chose to answer some of those questions. This one sounds so interesting! I will definitely have to check it out.